Navratri is an important Hindu festival, celebrated with religious fervour and great enthusiasm by the Hindus in different parts of the country. According to Hindu calendar, Navratri is observed on the first day of the Shukla Paksha (Waxing Phase of moon) in the Hindu month of Ashwin (September- October). Navratri falls on September and the nine day long, Navratri Festival will be celebrated from September - October this year. 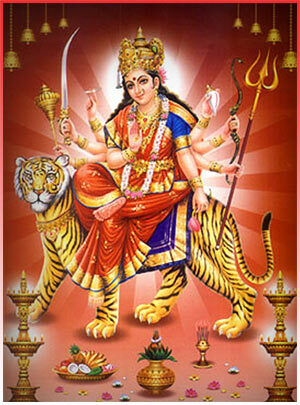 The nine days and nights of Navratri are entirely devoted to Mother Goddess . Throughout this period, fasts, strictly vegetarian diet, chanting mantras in honour of the Goddess Ambe Maa or Shakti, religious hymns, prayers, meditation and recitation of sacred texts related to Mother Goddess form part of the observation of the Navratri. Besides the spiritual aspects of Navratri, there are a number of other customs, rituals and Garba, which are associated with the festival. During the Navratri, Garba performances begin at the night. The performances are arranged by different cultural committees. During the 'Garba night', the participants gather at an open space, at street corners. They stand in a circle, around an idol or photograph of Goddess that is kept in the centre. Navratri is a very unique Hindu religious festival of worship of Goddess, rituals, music, Garba and merriment culminating in the celebration of Vijayadashami or Dussera festival that commemorates the victory of good over evil.